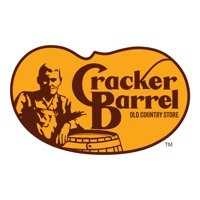 Developer: Cracker Barrel Old Country Store, Inc. 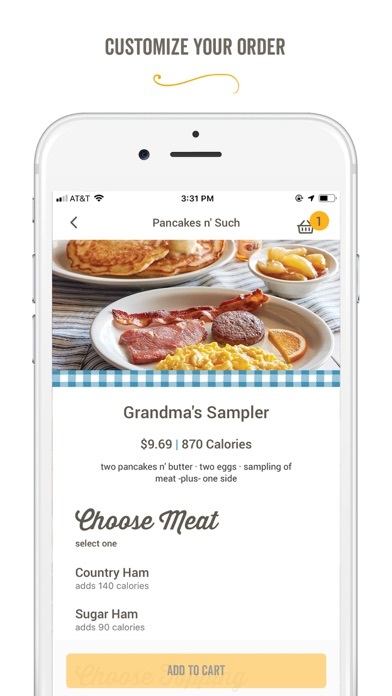 The all-new Cracker Barrel app offers even more convenience. From finding the closest Cracker Barrel to beating the line when you dine or ordering homestyle favorites to-go, we think you’ll find lots to love. 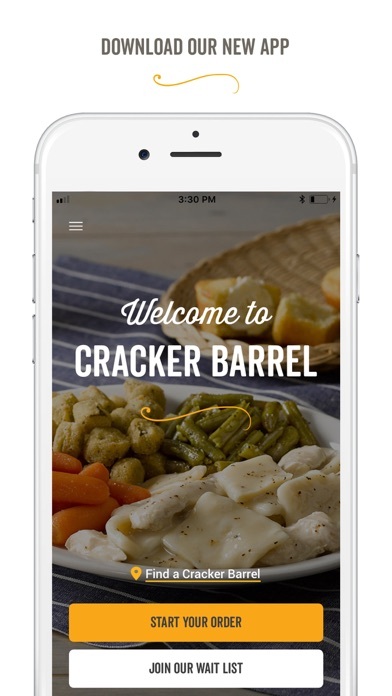 FIND A LOCATION Get directions to your favorite Cracker Barrel store or view store details with one tap. ORDER ONLINE It’s easier than ever to place an order at any time for your favorite Cracker Barrel meal. Simply select a location and pick-up time, and customize your order. 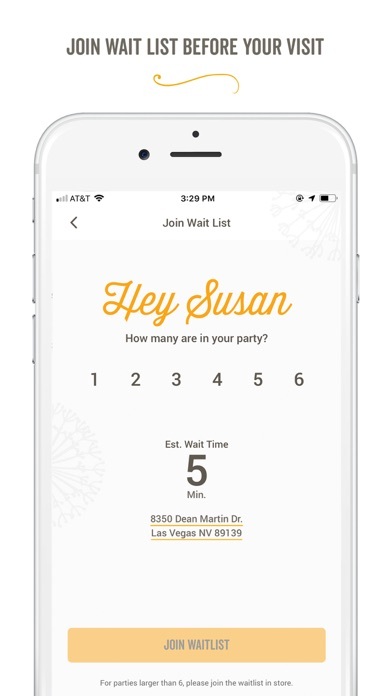 JOIN ONLINE WAIT LIST Add your name to our Online Wait List before you arrive for parties up to six. Or, simply check the wait time at Cracker Barrel stores. EXPLORE Access our Catering and Online Gift Shop through direct links. App said 20 minute wait do we came on only to have the hostess tell us the wait time was 45 minutes plus the 20 minutes from our initial sign in. Have used the app numerous times to put our names on wait list. Wait list says 15 minutes show up after 13 minutes and told 20 minutes. Wait list said 20 minutes show up 20 minutes later and still wait 25 minutes. Time to hire someone who can write a better algorithm. Love when we have a 20 minute wait because the shopping is so FUN! This is the greatest gift store! Seasonal ideas are so fun! Children’s clothes are so age appropriate! Books on tape to rent while traveling @$3.50 a week! Regional gifts also amazing AND the menu is HUGE!!! You can’t order as one of your side item choices the side of the day. That is a deal breaker. I have to call in or go in if I want today’s side item which could be cabbage or dressing or sweet potato casserole! The whole point of using the app (for me) is not having to wait in line-over the phone or inside. Just downloaded the app and it could not find a store in the entire USA, much less the one located just one mile down the road from me. People who write these apps should have to use them personally before that are ever released to the general public. Today I used the app to check my party in for lunch. It’s Sunday so you can imagine the wait had we just driven directly over. From home I put my name on the waitlist. The wait was 25min. We arrived about 15min later. When I checked in, the people ahead of me were told that the waitlist was (still) at 25min. We waited for less than 5min and our name was called! It was a great experience and I will definitely use it again. By the way....we had a great hostess who explained the specials very thoroughly. Our waitress, a one star employee was superb. I asked a question which she was not sure of. She immediately went to the manager and got my answer. She checked on us often and served us a very good, hot meal. When I first got this app it worked. Now for the last several updates I am not able to join the wait list. I put in info usually for 4 people and the confirm option is greyed out and will not work. I always end up calling or going to CB to place my order because the app doesn’t have what I want. I want to order the 4 vegetable plate for 7.99 that is on the menu at my CB. The app has a 3 vegetable plate for seven twenty something. If you add another vegetable, which it doesn’t give you the option to do from the 3 vegetable plate choice, you would end up paying more. Also, I like the country house salad with grilled chicken and backed potato. Sadly, it is no where to be found on the app. I order to go occasionally. The phone auto attendant encourages me to try their app. This time I remembered that before calling and decided to download and try. App looks good. I like that it let me proceed as guest without creating account. I quickly found local store. Browsing menu seemed intuitive and I was able to build the order. Ran into trouble at checkout. Tapped payment with hopes to find Apple Pay as I did not have my credit card handy. Sadly, not only Apple Pay missing but no options for Amazon, Google, etc or even PayPal. Well, maybe at least click credit card will pop up web type list of credit cards in my wallet, nope. Not even option for scanning a credit card with camera. Only option was typing in card manually (like an animal 😆) So, I decided to change to “pay in store”. It was at this point app froze about 5 minutes into this process. I exited app and called store by phone. Had order placed within two minutes. ——————————————— Update: I decided to give app another try. This time I was able to successfully order a dinner and dinner salad with option of “pay in store”. When I arrived order was ready but price was higher than expected. When we checked the order the app had put in for four salads 😆. It would be must helpful if there was a comment section either on each item or at the end where you can specify your needs. For example I don't want sawmill gravy for my chicken friend steak, I want brown and I want it on the side. Either there needs to be a comment feature or there should be options. The wait times are very misleading and always underestimate the time. It may show a 10min wait only to show up at the restaurant and it actually being 40min or longer. This needs to be fixed. Twice the waitlist has given us a specific wait time and it has been inaccurate. This last trip, our wait time was 15 minutes according to the app. We waited 45 minutes for a table. I have used it a few times to order carry out and found the pictures of the menu items helpful. My only suggestion to the developers for an improvement opportunity is to enable customizations on orders. For example, take the double meat breakfast. What if the customer is in the mood for it to be all bacon. Not an option currently on the app. Pretty good app, but lacks the option to order the daily special and vegetable of the day. Pretty big oversight. Of course, they could just stay serving lima beans and cornbread dressing EVERY day, and that would solve half my problem. I entered all the info on the “place your order” page, but the button that allows you to proceed is never enabled. Too bad - it would be nice to have a way to order pickup instead of the current, error-prone phone-in method. Can’t choose daily specials for dinners or daily vegetable choices! The waitlist part of the app doesn’t work. It said it was a 15 minute wait so I put our name on the waitlist. Showed up and had to wait an extra 40 minutes. 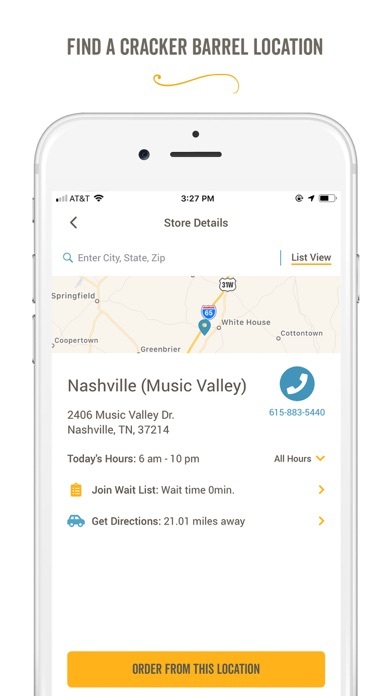 App won’t allow joining wait list at the Cracker Barrel, Gumbranch Rd, Dickson, TN location. Please fix it. Told manager last week and she said she couldn’t do anything about it. One week later, still can’t join wait list. Ugh!!! The app works great and I appreciate the opportunity to order and pay at the store. It could improve by offering “sour dough bread” toasted, grilled, or plain as a bread option. When I order at the table I always prefer the bread over the muffins and biscuits. Also... there is no option to order the dessert of the day cobbler is served right now but never on the app memo. A notes section would be good too for notes like extra butter and jelly. I am outside a Cracker Barrel, yet the app cannot find a location within 50 miles! 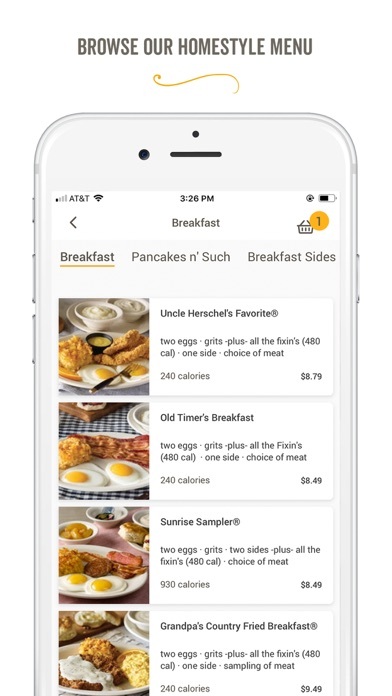 Woke up early, had a hankering for Cracker Barrel before work, downloaded app, and to my displeasure I cant order on your app. Got my order ready and then , can’t place order button don’t work. I thought I had to create an account. Got all my info entered in, and then I was shut down again as the “next”? Button don’t work. What a waste of my time!!! I tried to place an order and can’t get past the pick up time and date. It keeps telling me orders can’t be made 14 days in advance. I was trying to make the order the same day. After today’s update I tried the app again and it seems to be working. I upgraded it to a 4 star and will try it out tomorrow for lunch. 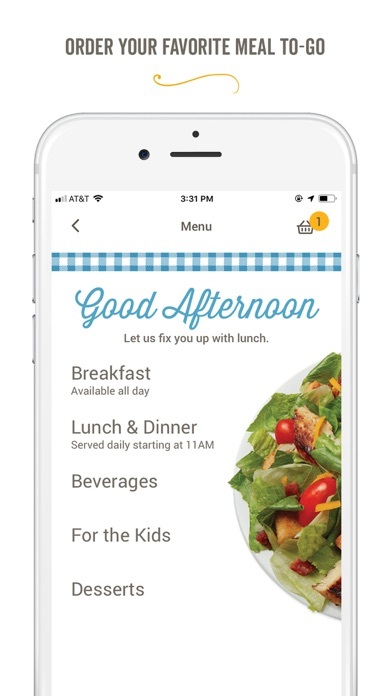 Solid app, but it needs a “favorites” feature so that I can save my favorite meal and more easily order it the next time. I enjoy using the app! My ONLY issue is that the menu does not have the option to choose their daily special. I downloaded the app just today. I chose to place an order for 45 minutes later TODAY and received the error “You may not order for more than 15 days into the future.” I continued to get this error message for any time today except ASAP. Kind of pointless to have the option if it doesn’t work. This app don’t work at all . It’s won’t let me sign up ,’ it’s won’t let you order. And I press on the side selection it’s let them go to your shopping cart, but you still can’t check out are place the order. And I’m hungry. And I had to call my order in . App waiting list is not real time. Two times happened when I check inside the restaurant the hostess said the double of time or more show me on the app. The app is 90% better. Thank you. Now please add the daily specials to the menu choices. Still have to call an order in if we want the special. Unable to create an account login. Walked into the restaurant and the waitress said we don’t need to do anything extra to check in. I waited for so long and the time hasn’t changed. Apparently she was wrong and the check in server put us at the back of the line. I just reinstalled the app and they’ve made significant updates that resolved the complaints I had previously (in my earlier review). Everything worked great. Good job, devs! You can not request sauces, jams, extra gravy, or any special ordered. I always get honey mustard with my grilled chicken and this was not an option anywhere on the app. I’m very disappointed at how little thought went into developing this app. I would not recommend using the waitlist option on the app. The wait time is not accurate. The store employees will tell you the time is not accurate upon arrival as well. I signed up with this app so that I could place an order. But then I found out that what I wanted to order was not listed anywhere in the house. So I ended up having to call over the phone and place an order. What was missing was the daily special the Sunday homestyle chicken. That selection was completely missing from the menu and so the app did not work. I was thrilled to download the app and anxious to order. When I went to pay for my items I couldn’t enter my credit card expiration date or the number on the back. I kept on getting a error and they were conflicting the dates. Could you please correct this issue? I ended up having to call the sire and thankfully I spoke a wonderful employee and told her what happened and placed my order to go with her instead! I like the updated design and easier to order now. I really don’t see why you can’t just view the menu without having to use the order menu. Unless I am blind ( not out of the question) I can’t find the daily specials and the daily veggie. Downloaded the app so that I could get put on the wait list. When we got to the store they checked us in at the bottom of the list. What’s the point of using the waitlist option in the app if we are gonna end up in the same spot. Waste of time!!!! Would rate zero stars if at all possible. I can't get it to work....had entire order ready & payment info put in, but then I couldn't check out. It wouldn't let me complete anything. Thought maybe I had to set up a log-in, but it wouldn't even let me do that. In the end I just had to call in my order by phone. Not very great when you want to use a card to pay online, but have to have someone else pick up the order who doesn't have that card on them.